2.1. 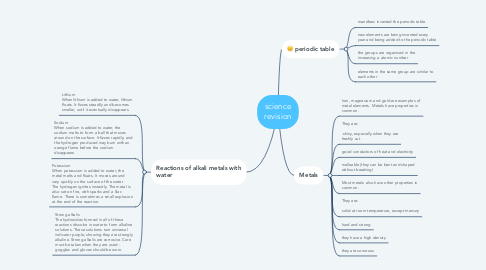 Iron, magnesium and gold are examples of metal elements. Metals have properties in common. 2.5. Most metals also have other properties in common. 3.1. Lithium When lithium is added to water, lithium floats. It fizzes steadily and becomes smaller, until it eventually disappears. 3.2. Sodium When sodium is added to water, the sodium melts to form a ball that moves around on the surface. It fizzes rapidly, and the hydrogen produced may burn with an orange flame before the sodium disappears. 3.3. Potassium When potassium is added to water, the metal melts and floats. It moves around very quickly on the surface of the water. The hydrogen ignites instantly. The metal is also set on fire, with sparks and a lilac flame. There is sometimes a small explosion at the end of the reaction. 3.4. Strong alkalis The hydroxides formed in all of these reactions dissolve in water to form alkaline solutions. These solutions turn universal indicator purple, showing they are strongly alkaline. Strong alkalis are corrosive. Care must be taken when they are used - goggles and gloves should be worn.